The outfits window, accessed via `, allows you to quickly change equipment with simple key combinations. 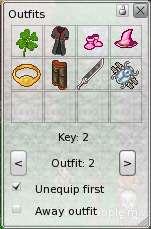 You can assign items from the inventory or copy your current equipment to the open outfit by pressing the ] key. Holding right control and pressing the assigned key will switch to your outfit.